Upgrading your PS4 hard drive is easier than you might think. The standard PlayStation 4 hard drive holds just 500GB, which is enough space for about a dozen modern games, at best. Upgrading the hard drive allows you to store more content and ensure your system runs at peak performance for years to come. Learn how to perform a PS4 hard drive upgrade without losing any games saved to your console. Since Sony doesn’t manufacture hard drives specifically for the PS4, your first step is finding a compatible hard drive. The PS4 comes with a hard disc drive, but you can install a solid state drive if you prefer. SSDs typically run much faster, but they're sometimes less durable and they're also more expensive. Your best bet is to purchase a hard drive from a company like Seagate, which manufactures hard drives optimized for the PS4. That said, any 2.5" laptop hard drive no more than 9.5mm thick should do; if you're making the effort to replace your PS4 hard drive, though, you might as well upgrade to at least 1 or 2TB. Changing your console's hard drive doesn't void the warranty. Most of the games you’ve purchased from the PlayStation Store can be re-downloaded to your new hard drive at no cost, so you should delete them before backing up the rest of your files to make the backup process quicker. Some content, such as the 2014 P.T. demo, has been removed from the PS4 network, so make sure you don’t erase anything you can’t get back. PlayStation Plus subscribers can also upload their save data to the cloud for later retrieval. From the PS4 home menu, choose the Settings option. Navigate to System > Backup and Restore > Back up PS4. After following the on-screen instructions, your console will restart, and backup will begin. Your PlayStation will restart once again when the process is complete, and a copy of your data should be saved to the external drive. Go to the PlayStation website and download the most recent software update for the PS4. Find the newest PS4 OS update, click “Download Update" and save the files to a portable USB drive. This step is required for your new hard drive to function properly. Open the drive and create a folder named PS4. Inside the PS4 folder, make another folder named UPDATE. Drag the PS4 OS update file, named PS4UPDATE.PUP, into the UPDATE folder. Be sure to safely eject the flash drive and set it aside for now. Before you begin, turn off your PS4, unplug it and place it on a steady flat surface. If you have a newer PS4, look on the back of the console for a removable panel on one of the corners. You may see a sticker indicating the size of the hard drive. This step will differ slightly depending on the model of your PS4. The pictures below are of the newer PlayStation 4 Slim. The PlayStation website has diagrams of each PS4 model you can refer to if you have an older system. With the back of the console facing you, remove the panel by gently sliding it to the right with your fingers. Although the PlayStation 4 Pro can hold 1TB of data out of the box, you may still wish to swap the PS4 internal hard drive for something more powerful. If you have a PS4 Pro, turn the console flat on its back and look for the plastic tab beside the Ethernet port. Remove it with your fingers to reveal the hard drive. The hard drive is secured to the console by a single screw bearing the symbols found on the PlayStation controller. Remove the screw with your Phillips head screwdriver, but don't lose it. You should now be able to remove the hard drive by pulling on it. The actual hard drive casing is held together by two or four screws, which you should unscrew and set aside. Take out the old hard drive and insert the new one without touching the bottom of either drive to avoid damaging them. Make sure the metal pins are facing inward, and close the casing by re-securing the screws. Place the encased hard drive back into the console and secure the decorated screw; slide the exterior cover back into place. Plug your system back in and reconnect it to your TV. Hold the console’s power button for a few seconds to restart your PS4. When you turn on your PlayStation, it should start in Safe Mode. You'll be greeted with a message such as 'Cannot start the PS4,' which is what you want to see. 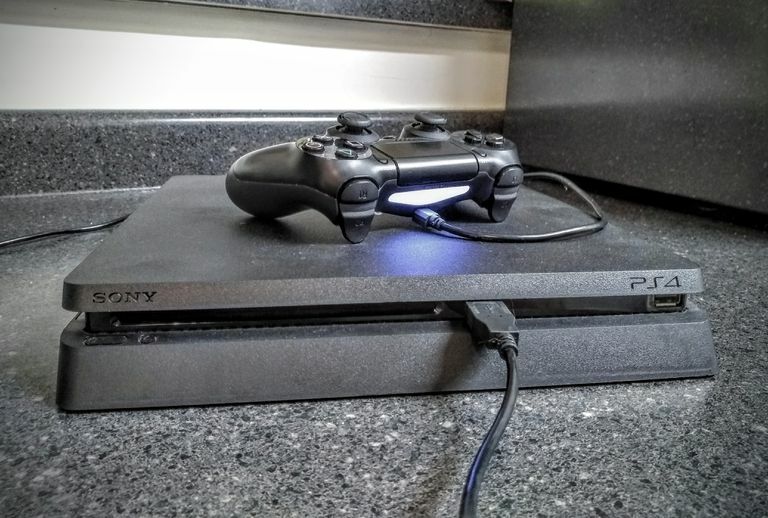 Connect a PS4 controller to the console via the USB cable and press the PS button. Now, you will be asked to insert a device containing the PlayStation Software Update into the console's other USB port. Plug in your USB drive from earlier, and then select OK and Yes on the next screen. After the update finishes installing, the system will restart again. You'll now follow the same steps you had to take when you originally purchased your PS4 such as setting the date and language preferences. Connect the external hard drive containing your backup data. From the home menu, go to Settings > System > Back up and Restore. Choose Restore PS4, select the backup file and follow the on-screen instructions. When your data is successfully restored, the system with restart one last time. When the PS4 home menu comes back up, it should look identical to how it did before the hard drive swap change. Your user profile, save data, and trophies will all be intact. As mentioned earlier, you can download games you previously purchased so long as they're still available in the PlayStation Store.